Obamacare Changes Emerge In House Repeal And Replace Bill : Shots - Health News After weeks of internal debate, House Republicans have released their plan for the Affordable Care Act, aka Obamacare. It faces challenges from within the GOP, from interest groups — and the public. 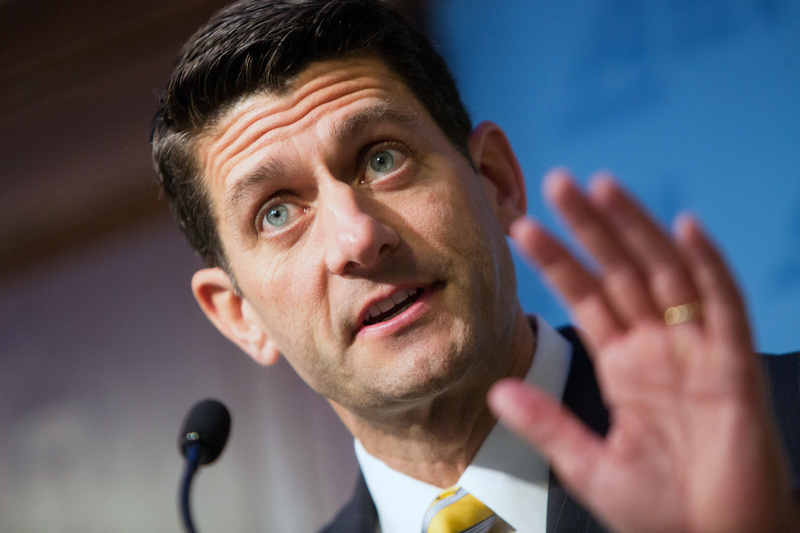 House Speaker Paul Ryan is leading efforts to repeal and replace the Affordable Care Act. After years of waiting, it's finally here. The Republican plan to reshape the Affordable Care Act — what they call "repeal and replace" — kills the requirement that everyone buy health insurance by eliminating the tax penalty for those who don't have coverage. It also makes significant changes in the financial assistance people can receive to buy a health plan. "Our legislation transfers power from Washington back to the states," said House Ways and Means Committee Chairman Kevin Brady, in a statement. "We dismantle Obamacare's damaging taxes and mandates so states can deliver quality affordable options." The bill would offer tax credits, refundable in advance, to people with incomes below $75,000. But those credits will be lower in many cases than the subsidies now offered in the ACA. The bill, which will go through many revisions and challenges, was released late Monday by two House committees, Ways and Means and Energy and Commerce. Members are expected to start voting on parts of the bill Wednesday. Rep. Frank Pallone, D-N.J., and Richard Neal, D-Mass., the ranking Democrats on the Energy and Commerce and Ways and Means committee, issued a joint statement saying the bill would "rip healthcare away from millions of Americans, ration care for working families and put insurance companies back in charge." The legislation will ultimately need approval by the full House and the Senate before it goes to President Trump for his signature. Until then, most of what is known as "Obamacare" will stay in place. But it's far from clear that Republicans in the House are unified in their support of the bill. Members of the far-right Freedom Caucus have said they oppose giving tax credits to people who don't pay any federal income tax. And with only a slim majority in the Senate, only a few Republican defections could defeat the bill there. Four Republican senators wrote a letter to Majority Leader Mitch McConnell saying they were concerned an early draft of the House plan would not adequately protect people who have insurance through Obamacare's Medicaid expansion. And Sen. Rand Paul was among three conservative Republicans who criticized an earlier version of the bill as "Obamacare lite." Under the proposed bill, tax credits would start at $2,000 a year for individuals under age 30, rising to $4,000 for those over 60. The proposal, first seen in a Feb. 10 draft of the bill, has been criticized as too meager to cover the full cost of a health insurance plan that provides full benefits. But the proposed tax credits could potentially pay for insurance that protects only against a catastrophic health event. They would begin to be phased out at incomes of $75,000 for individuals and $150,000 for families. To encourage people to buy coverage, the plan allows insurers to charge a 30 percent penalty to people who let their insurance lapse and then try to buy a new policy. In states that expanded Medicaid, people who are eligible can continue to enroll until Jan. 1, 2020, and those states would continue to benefit from the federal government paying a greater share of the health costs of those beneficiaries. The bill includes a couple of provisions to please abortion rights opponents. Tax credits won't be available to pay for insurance policies if they include abortion coverage. And the bill "defunds" Planned Parenthood, meaning it bars Medicaid from paying for health services provided at the clinics. Medicaid is already barred by federal law from paying for abortions, and women's health advocates say the provision is likely to make it harder for low-income women to get birth control, screenings for cervical cancer and mammograms, which Planned Parenthood provides. Several taxes contained in the ACA would be repealed at the end of this year. These include taxes on health insurers, pharmaceutical and medical device manufacturers and a tax on high-cost employer-sponsored group health plans (aka Cadillac plans). An analysis by Avalere Health and McKinsey of an earlier draft of the bill, which contained many of the same provisions, concluded that it would lead to millions of people losing coverage. The plan offered by the House Republicans falls short of the outright repeal that has been demanded by more conservative members, including those in the House Freedom Caucus. That could be due to the shift in public attitudes toward the ACA in recent weeks. Public opinion has grown more favorable as major changes appeared imminent. A Kaiser Family Foundation tracking poll in late February found 48 percent having a favorable opinion versus 42 percent viewing the law unfavorably. Kaiser says the shift is due largely to a change in the view of political independents, among which 50 percent now view the law favorably. We will have more on this story as it develops.